Parallel co-rotating twin screw extruders have excellent mixing performance,good self cleaning performance and flexible modular configuration characteristics which make them suitable for processing different types of material systems,and are extensively used in fields of polymer processing ,foodstuff processing and chemical products, especially for various high molecular materials. In most cases ,parallel co-rotating twin screw extruders are used as mixing equipments .ln processing high molecular materials,the modification process and master batch preparation of polyolefin materials and engineering plastics require sufficient and intensive mixing,which differs depending on material systems, Excellent equipment performance,reasonable mixing process,advanced combination technique and rich processing experience are the key factors determining the success and efficiency of mixing. This screw of the co-rotation twin-screw exturder are composed of multi-sections. The raw material obtain optimization of compounding after undertaking high speed, hith torque, compounding in the barrels, fixed feeding system, it can input glass fibers, additives. 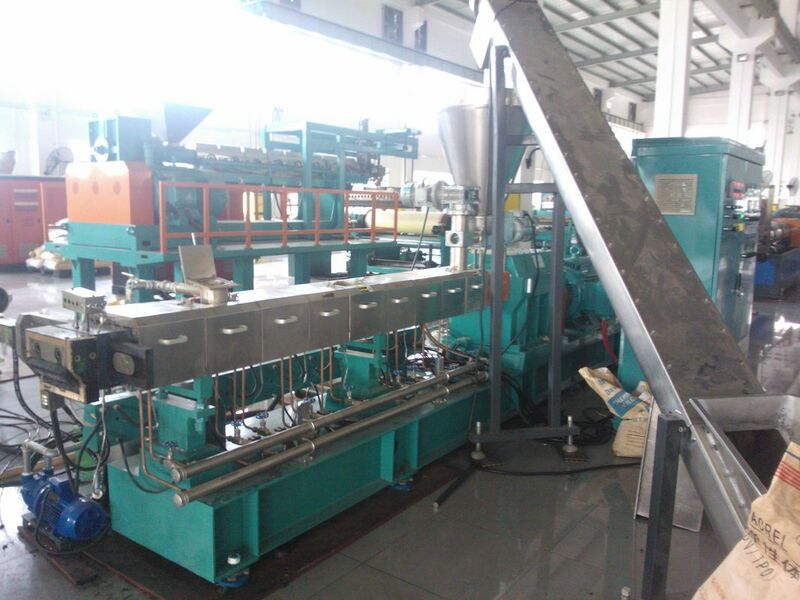 It'smainly used to process the products such as engineering plastic, plastic including glass fiber, high density master batch etc.